I am a young adult who, like so many others, dreams of traveling the world before I decide to settle down. However, I also care about the environmental impact I may leave behind while exploring. When I am traveling or camping, I am now cognizant of how much trash I am producing over an expanse of just a few days. Traveling makes one unknowingly produce more waste than normal because the traveler has no established living space. The traveler is more likely than not left with buying all meals instead of making them, buying souvenirs, using more gas for flights and land commuting, and so on. Other ways of travel that I, along with many others experience, is camping for extended periods of time. From the onset of my camping excursions, I rely solely on the contents of my backpack for the next few days. After my friends and I eat through some of our food, the backpacks become lighter and the trash begins to add up. Sure, it would be easier to leave the packaging behind - so I don’t have to deal with food particles tossing around in my bag, and the bugs it could bring forth - but then the adventure would be all about me and what is in my sole interest. I camp to connect with nature, not to come stumbling through and leaving ample evidence that I was there. Pack it in, pack it out. Remember: try not to flash your light in other people’s faces! Sleeping gear: tent/hammock, ample blankets and warm clothes- you lose a great amount of body heat through your feet and head. Tip: I keep airplane blankets for such occasions. A journal: preferably with unlined pages for doodles. I don’t go anywhere without one! Chocolate: I learned my lesson the first time around when I didn’t bring any. Hygiene products and Toilet paper: no explanation needed. Biodegradable sunscreen: normal sunscreens have been shown to bleach coral reefs! Bug repellant: coconut oil works like a charm! Citronella is great also. A few items of clothing: everyone is going to be slightly smelly. Don’t forget to establish a personal, sealable trash bag that is small enough to keep in your bag, and remind everyone else to do the same. A group trashbag always turns into a disaster. Do not forget toilet paper because others usually do, and you will save the day. If you have a small instrument, it could liven up the mood, such as a flute, harmonica, or thumb piano. Clothing: it depends on how long you will be camping for. If I go for three days, I leave home in the hiking clothes I will wear the rest of the day. I will wear my bathing suit top in place of a shirt oftentimes because it will get cleaned up jumping in the ocean. I have a designated thermal sleep shirt with sweatpants, a fleece sweater, beanie, socks, and about three lightweight blankets. I have woken up too many times in the wee hours of the morning freezing to the point where it’s hard to get back to sleep. Do not overpack, make every clothing item count. I always bring a few sarongs. As for hydration, it is always best to bring your own water instead of having a ‘group’ water situation. No one knows how much water someone else will drink, or exactly how far you will be traveling, I am speaking from experience. You know how much water you drink, so cover your own bases and don’t rely too much on others for your own needs. If I go for three days, I will bring a gallon for myself plus two extra water bottles to stick in my bag. I would rather have extra than not enough, and someone almost always runs out. This also depends on location. If you are in an area where there are streams or rivers, just bring a strong water filter and then you don’t need to worry nearly as much, but if you are camping along the coast where there is only saltwater, definitely bring enough to make up for the salty air dehydration! More often than not, my camping or travel group will go shopping for food together. This way, we can see what everyone else is getting and even coordinate group meals most of the time to distribute weight in our packs more evenly. We will all get snack foods and such for ourselves, but usually for breakfasts and dinners we share, which I have found makes it easier and more abundant for everyone. Try to avoid packaged food, but if you must, aim for biodegradable or recyclable products - no styrofoam please! Also, keep your backpack organized. It is easy to mess it up just looking for one item, causing an eventual losing of the mind if you let it get too out of control. When you have a rest break, unpack and pack again. With regard to protection, I would recommend bringing a knife along. You never know when you will stumble upon a fish or turtle caught in ocean garbage, and a knife almost always proves useful for other random events. 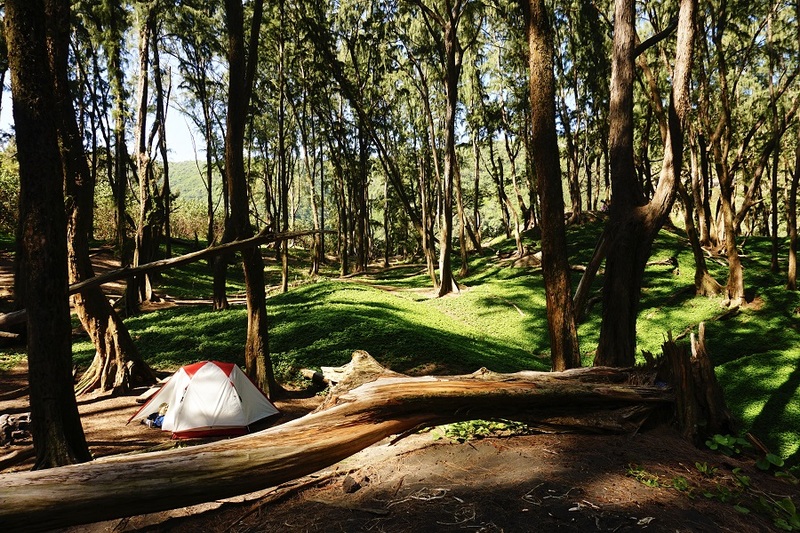 I have never felt threatened by another entity while camping around Hawai’i, but being a female in a man’s world, I do sleep with mine when I am outdoors. Don’t forget to oil the blade after use. Every camping experience provides me a lesson of what I could do better next time in terms of efficiency and packing strategies, so pay attention to what you forgot or wished you would have brought with you. These things make the next trip even better. Check out the Leave No Trace website to see what you can do to make camping more enjoyable for your oneness with nature. Be safe, happy adventuring, and remember that your actions define who you are.